John Carey has a well-earned reputation for creating elegant and commercial card magic and these four routines will show you why. 1. Triple Prediction: Another beautiful construction as this time John predicts three cards and the actions of a spectator in a delightfully devious fashion. Super strong and commercial. 2. Deja Boo! : An uncanny demonstration of Deja vu using a lovely presentation and a beautiful Larry Jennings move. Squeaky clean and so practical! 3. Ambitious O'Henry: A beautiful multi-phase small packet ambitious card with a very sweet off balance transposition! Simple, subtle and strong. 4. 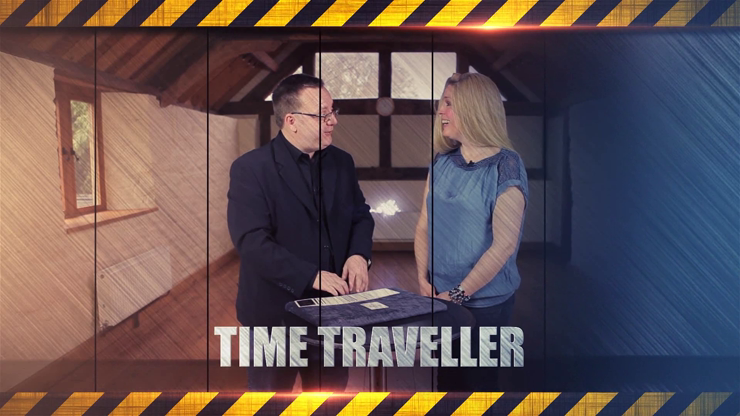 Time Traveller: Watch Carey demonstrate time travel with this awesome little piece. Utilizing a brilliant but little known Brother Hamman idea, you will add this to your repertoire immediately! "I pay attention to his work, follow it, enjoy it, and often find bits of inspired thinking I'll incorporate in my own work. I'd bet that you'd reach the same conclusion." I pay attention to his work, follow it, enjoy it, and often find bits of inspired thinking I'll incorporate in my own work. I'd bet that you'd reach the same conclusion. John is an alchemist; he turns moves you already know into the miracles you've always wanted to do. Imagine Card at Any Number, Searchers and Pocket Interchange all for the cost of a discrepancy and double lift. He's also able to squeeze solid, commercial magic out of coins with no wasted effort. Frankly he ticks me off! John Carey is well known within a limited circle in magic for his uncanny ability to apply subtlety and subterfuge to effect magicial moments of the highest order. It appears that now is the time for that circle of knowledge to be expanded... no knuckle busters, no pipe dreams, no angle limitations - these are all real workers. John Carey has a knack for creating strong, direct card miracles using simple and devious methods. The routines shine brightly in the real world.